Ivan Steels won the Ramsey AS match. Once again it was tough going at just about all of our stillwater fisheries at the weekend. There were a few good weights about, but there were also a lot of disappointed anglers. John Whincup won twice at that weekend. Unfortunately that’s how it is through the winter months and it’s what we should expect. The HAJAC Winter League got underway at the weekend, with extra anglers making up teams after the demise of the Sensas League. Three separate venues were used - Factory Bank, the Old Nene at Benwick and the Twenty Foot Drain at March - and it was the latter that just about everyone wanted to draw as it’s been in cracking form around the bridges at the March end. And it didn’t disappoint with some huge weights taken there. In fact the top five anglers all came from the two sections on the in-form drain with Martin Roper leading the way. He put a big net of roach to the scales weighing in at 36lb 5oz. He fished a five-metre whip for most of the day feeding heavily with pinkie and maggot. Just behind was Alex Bates, who alternated between the waggler and pole to finish on a level 35lb. Anthony Watling came in third on 32lb 4oz. Factory Bank did produce a 14lb weight and some reasonable backing weights but unfortunately the Old Nene at Benwick was difficult to say the least. On the team front it was Sensas Mark One White leading the way on 27 points, then came Tackle and Bates and Stanjay Gold both with 29 points. Ramsey AS held their latest club match on the Old Nene at Ramsey St Mary’s and found plenty of fish willing to feed. Taking the honours with a very respectable 10lb 15oz was Ivan Steels. He drew peg eight and caught the majority of his fish on the waggler fishing pinkie. Second place went to Malc Hobbs, who was also on the waggler, but caught best on red maggot for 10lb 4½oz. Third was Frank Bevilacqua with 7lb 11½oz, all small fish taken on the whip, followed by Keith Rayment with 7lb 5½oz. On Saturday Whittlesey AA tried their luck on the Old Nene at Benwick. It’s usually one of the most reliable of winter venues but the better fish are not showing. Matchwinner Jeff Tuttlebee put a modest 2lb 4oz to the scales, alternating between the pole and waggler and fishing squatt to take a net of small roach. 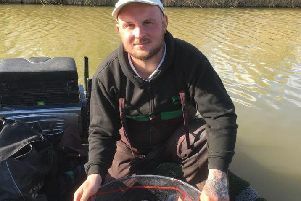 Runner-up was Andy Lawrence, who fished pinkie over groundbait for 2lb 2oz, then came Martin McHugh on 1lb 14oz. Tony Evans is one of the area’s top matchmen and decided to run a winter league event spread over three pools on the Decoy Lakes complex this year and as the Angling Trust Winter League final just happens to be on the same venue it has created a lot of interest from outside of the area. Having said that we have some very talented local rods who know the water well and looking at the results of the first match it would take a brave man to bet against a local rod picking up the big payout at the end of the series. Leading the way from Elm peg nine was John Whincup.The peg is known to be one of the best on the complex right now, but you still have to catch them as the saying goes. And Whincup is much too good an angler to mess up. He romped home with a fine 110lb 7oz. He caught steadily all day fishing a long pole line feeding and fishing pellet, with the occasional fish falling to red maggot. Runner-up was organiser Evans on peg seven on the Horseshoe Pool with 99lb followed by Simon Godfrey on Elm 12 weighing in 54lb 9oz. It turned out to be a very good weekend for Whincup as he also took the honours in the Decoy Saturday Open fished on the Willows. He drew hot peg 25 and when your luck is in you have to make the most of it which he did. He fished a straight lead with pellet across to the reed bed to weigh in 92lb 6oz, nearly all carp taken on pellet. Simon Godfrey did well from peg 18, taking second place with 77lb 9oz on the pole and pellet approach. Third on peg 29 was Graham West, who fished long to the point of the island for 57lb 5oz. The Sunday Open was fished on the Yew Pool which proved to be very tough indeed. Top rod from peg seven was Kye Rawlings. He caught on the pole and feeder with red maggot for 41lb 12oz. Runner-up was Andy Patten on 27lb 7oz, then came Steve Palmer with 17lb 7oz.